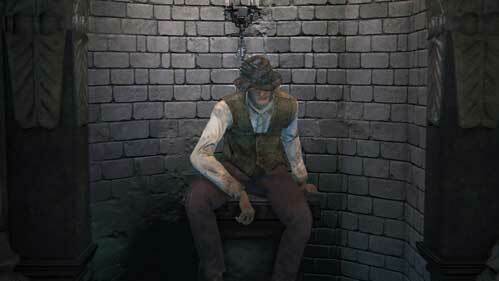 Narrow Minded Man or Skeptical Man is an NPC in Bloodborne.
" A skeptical man situated in the building directly across from Arianna's home, is incredibly distrustful of hunters." After Arianna has asked for somewhere safe to go and is sent to the location provided the Skeptical Man will ask the Hunter what their deal is and what location they should go to. The Skeptical Man will go to the location OPPOSITE of what he is told. For example if the Hunter tells him to go to the Oedon Chapel he will go to Iosefka's Clinic. If you wish for him to survive safely with the other NPC's tell him to go to Iosefka's Clinic and he will arrive at the Oedon Chapel instead. Once in Oedon Chapel, he frequently dispenses bits of advice that are all hints. However, the truth is usually the exact opposite of what he says, with the exception of the advice he dispenses about the Suspicious Beggar. Drops 118 Blood Echoes and 3x Pungent Blood Cocktail if killed. Cathedral Ward directly across from Arianna's window. "Ah you, the swindlin' offcomer. Did you really think that'd work? There's no fooling me. Now, off with ya, you heard me? Go away! I can't stand the stench of your lyin' breath." "Let me give you a nugget of advice. Is incredibly distrustful of hunters and when asking where to go for safety will go to the opposite location of what he is told. Believes the Hunter is tricking the local civilians of Yharnam. His attire can be found on the streets below the Healing Church workshop tower. He also wears Gehrman's Hunter Trousers. Will periodically provide the Hunter with tidbits of advice. In each case, the exact opposite of his advice is true. His voice actor is Lee Whitlock. He&apos;s talking about the chapel dweller, not the suspicious beggar. It&apos;s obvious from the "acting like he owns the place" line and the fact that he mentions a beggar regardless of whether or not the suspicious beggar is at the chapel. I haven&apos;t seen anyone mention this, but he appears to be the only NPC that you can direct to a safe place multiple times before reloading the area. Most NPC&apos;s will take your advice, and then upon talking to them again, will simply thank you without restating the question. The Skeptical Man, however, will ask the same question a second time, so if you messed up by telling him to go to Oedon Chapel (which will send him to Iosefka&apos;s Clinic), you can talk to him again and tell him to go to Iosefka&apos;s Clinic. You can do this indefinitely until you reload the area and he makes his move, and as far as I can tell, he always goes to the opposite location of your last suggestion. His advice regarding the Blind Man refers to the Oedon Dweller not the Suspicious Beggar, as this advice can be heard even if the Beggar was killed or sent to &apos;Iosefka&apos; without ever going near the chapel. So all his advice is lies. On his window, now the only one talk is patches the spider.. what should I do? I told him to go to the chapel and he went there... Wiki seems untrustworthy. Weirdly enough, even though what he says is lies, his advice about the blind man is actually really useful. is it really strange that i somehow managed to get the tonsil stone from the narrow minded man? i mean, i didn&apos;t have access to forbidden woods yet so it threw me off when he gave a different toned dialogue and gave me it. Wasn&apos;t the one guy in forbidden woods the only way to get tonsil stone? "Ah, your lies spin a web, but I see through your deceit. I did not learn from books. No, no, no! I learned it all with my own mind." This random dude just goes ahead and blurts the entire point of the game, lol. I completed this game a bunch of times since last year and I have never once known about this guy, lol. what does he give you if sent to the church. i accidently sent him to the clinic. I didn&apos;t unlock the ability to send survivors to Iosefka&apos;s clinic, can I still get him to go to the church? I&apos;m guessing I can&apos;t just by withholding information? Gascoigne&apos;s Daughter gets killed no matter what and this guy has the chance to live? ***** that. Out of all the characters in the game he&apos;s my least favourite. He never develops, has no interesting storyline and constantly calls you a liar. You have to lie to him because he&apos;s such a halfwit just to keep him alive and he remains ungrateful like that old hag but at least she gets nicer ... kind of. Actually she scares me more so when she&apos;s kinder. After sending the prostitute to chapel, his dialog starts by saying he overheard our convo, so I suggested the clinic and he rejected it; then suggested the chapel and he rejected it. Finally, with held the info option and he calls me a lier lol. i walked away, came back and tried to switch things around and still the same reaction, but when i traveled to the Hunter&apos;s Dream and back to the chapel, this dbag appears where I want him to be with the other suvivors. Bug? I went to talk to him at his original spot after I defeated Vicar Amelia but there was no response. If you tell him to go to the chapel, he will still go to iosefka&apos;s clinic even if you have never talked with iosefka and she hasn&apos;t asked you to bring in survivors. How would he even know about the clinic? I think if you send someone to the clinic already he&apos;ll know and will refuse to go to the clinic.